One’s social identity is constituted in and through the act of naming. A name simultaneously interpellates the addressee and confines their resistance to the name’s religious, social, gender or racial oppression to the manoeuvring space warranted by that particular delimitation (e.g. gay, black, disabled). 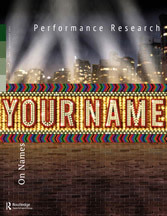 Since the 1960s rise of identity politics, several strategies have emerged in response to the closure of naming: the re-appropriation of injurious names; self-naming; and abject art, a form of public outrage at the increasingly invisible violence perpetuated by consumerist, class and gender interpellations – demands placed on the recessive realm of being which resides beyond naming.